26. Break cues. Some players think extra weight will help give their breaks more oomph, but the key ingredient for power is speed. A lighter cue will help you accelerate more quickly and with more control. Some players go a full ounce lighter than their playing cues. "I just went an ounce lighter than I used to break with,' said Stevie Moore in June. "It seems to be working pretty good so far.' Of course, others opt for the same weight as their regular cue, preferring their accustomed feel. 27. Practice, Part I. 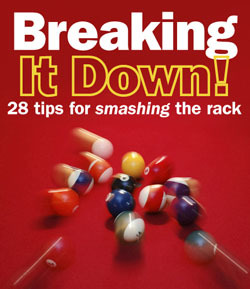 To get a feel for your break and how the balls will typically react, set aside a few hours and break the balls 100 times in a row. Thorsten Hohmann suggests always racking the balls in the same order and then tracking where each went (at least, which hit a pocket). Make a chart and record the results. Switch positions and/or speed every 25 racks.